No matter how the season has gone, good or bad, beating a rival at the end of the year is always one of the most important goals. Both Southington’s Matt Thompson and Nikki Carter played big roles in helping their teams do exactly that last week. It was a bittersweet end to the season for the Southington football team. The Blue Knights missed the Class LL playoffs for the first time since 2011 due to points after wins by Fairfield Prep and Sheehan earlier on Thanksgiving Day, but Southington did more than its part. The Blue Knights came away with their sixth straight Apple Valley Classic win over Cheshire on Thursday, beating the Rams 30-22, in large part thanks to their defensive effort. The Blue Knights responded by intercepting Cheshire quarterback Jack Raba three times. Thompson came up with the second pick and returned it 25 yards for what would be the deciding score with 2:30 left in the third quarter. The junior also had six total tackles and two pass break ups to earn himself defensive MVP honors for Southington. But Thompson was also quick to praise his teammates that helped prepare him and the rest of the defense to be successful. Carter also delivered a memorable performance, helping the Southington powder puff football team reach a couple of milestones along the way. The Blue Knights had never beaten rival New Britain in their annual game at Veterans Stadium and never beaten the Hurricanes in back-to-back seasons, that was before last Wednesday night. Southington shut out New Britain 20-0 with Carter leading the way on offense, scoring two rushing touchdowns - the first from three yards out in the second quarter with the second coming in the third quarter on a 15-yard run. She finished with just three carries, but the final two, turned out to be two of the most important. A soccer player during the fall season, the Blue Knights utilized Carter’s speed to outmaneuver the Hurricanes’ defense. And most often than not, New Britain simply didn’t have an answer for the senior once Southington got into the red zone. And Carter certainly provided plenty of mismatches and headaches for New Britain on Wednesday. 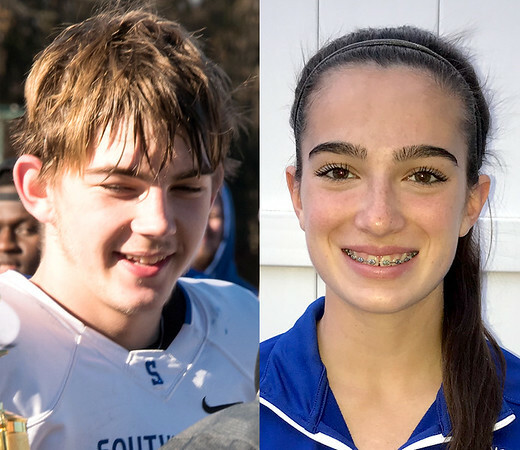 Posted in New Britain Herald, Athletes of the Week, General Sports, Southington on Monday, 27 November 2017 22:48. Updated: Monday, 27 November 2017 22:50.